Since Angie Hancock?s first ever visit to Harlem, NY, in the summer of 1997, she fell in love with what had been considered the Black Mecca of NYC. In 2005, she launched her own business called Experience Harlem. Today, Experience Harlem is an award-winning marketing solutions multimedia company that connects consumers with upper Manhattan?s best shopping, dining, arts & culture venues. And over the years, Hancock has expanded the scope of Experience Harlem. Among the company?s products are: Essential Harlem Guide, an annual booklet highlighting the best of Harlem; Experience Harlem’s website, a continually updated site and blog; Experience Harlem-curated Events & Experiences–the pioneer of the original Harlem bar and restaurant crawls; e x p e r i e n c e s, a periodic newsletter offering sneak peeks and inside looks into the best of Harlem; Experience Harlem App. Hancock, who grew up in Maywood, IL., graduated from the University of Illinois with a bachelor?s degree in accounting, and then worked as a certified public accountant at Ernst & Young. She later joined Sara Lee Corp. in 1995 as an auditor. Hancock went on to obtain a master?s in business administration from the Kellogg School of Management at Northwestern University in 2002. Hancock, who received The Network Journal?s 40 Under Forty Achievers award, tells TNJ.com her business building process. TNJ.com: Why do you feel Experience Harlem has been able to thrive for so many years? Angie Hancock: We attribute our ability to thrive in our commitment and passion to the small business community in Harlem. I?ve always looked out for my clients even when we?re not actively working together by referring them to resources to support their businesses as well as always supporting myself. ?Also as a resident and homeowner in Harlem, I?m super passionate about ensuring the businesses that made Harlem an attractive place to maintain a presence here. Beyond our media business, over the years Experience Harlem has consulted with various institutions in upper Manhattan to support small businesses including Harlem Commonwealth Council, Harlem Business Alliance, Harlem Community Development Corporation, Greater Harlem Chamber of Commerce and Bradhurst Merchants Association. Our consulting ranges from small business development to improving technical skills through the digital marketing class we teach a couple of times a year. TNJ.com: How has the changing face of Harlem affect your business? Angie Hancock: The changing face of Harlem has created more interest overall in what?s going on in Harlem. People are excited to see what the buzz is about and we continue to be a resource connecting residents and visitors to Harlem?s best shops, restaurants, arts & culture. The unfortunate side of the changing face of Harlem is the increasing interest and development has increased rents significantly forcing some of our institutions (Lenox Lounge) out of business. TNJ.com: You have branched out into other areas over the years. Please tell us about the Essential Harlem Guide? Angie Hancock: The Essential Uptown Guide features over 150 of upper Manhattan?s best shops, restaurants, arts & culture institutions in Harlem, Washington Heights, and Inwood. Our guides are available all over the neighborhood as well as select tourism kiosks all over the city such as Herald Square and Grand Central Station. Everything in the guide is also available on our website?and our app along with upcoming events and special promotions. TNJ.com: How and why did you start the Experience Harlem-curated Events & Experiences? Angie Hancock: Moving into actual ?experiences? was a natural evolution for us. As a concentration of restaurants initially emerged on Frederick Douglass Blvd, now known as Harlem?s Restaurant Row, we launched the ?Experience Harlem Bar & Restaurant Crawls in 2010 starting with 6 restaurants then growing to over 30 restaurants covering both Frederick Douglass Blvd and Lenox Ave with over 1,200 attendees. We?re very proud that we were able to introduce thousands of people to the Harlem restaurant scene 2010-2015 when we produced the bar crawl events. We now create custom experiences for our clients. TNJ.com: Tell us about the Experience Harlem App? 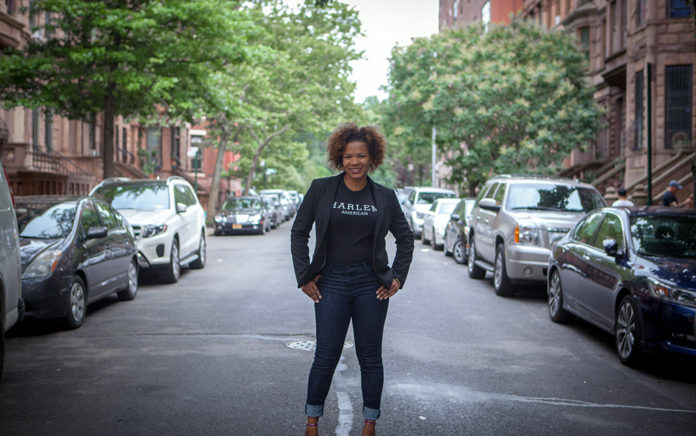 Angie Hancock: The Experience Harlem app launched last year and is still in its infancy. We launched the app to provide another access point for our consumers who are interested in knowing what?s going on but may not have a guide at their fingertips. TNJ.com: What has been the most challenging aspect of growing your business? ? Angie Hancock: The most challenging aspect of growing my business continues to be access to the resources to tell the amazing stories that are taking place uptown and to reach the audience that is interested. TNJ.com: What has been your biggest business lesson since launching Experience Harlem? Angie Hancock: While I started my career as an accountant before switching to marketing, in the early days of my business I did not have a rigor with the numbers as I needed to. Receivables were slow coming in and I was funding payables from my savings. Since last year I implemented ?Money Monday? where I set aside time every Monday to work on invoicing, collections, writing and following up on proposals. It?s made a huge difference as it?s easy to busy yourself with the endless to-do list of running a business but let the numbers get away from you. Angie Hancock: I enjoy making a difference. There?s nothing better than having a client thank me or receiving an email or letter saying someone appreciates what I?m doing.